Team 34 with 3 members, lead chef Pham Van Dai, Nguyen My Chuong, and Vu Kien Quyet, from Palace Vung Tau had brought a curious-to-be menu, including: 1) Salad Thun Mun leaves with avocado, crabmeat, and salmon caviar in hibiscus sauce; 2) Shrimp and periwinkle kneaded with chili leaves, served with Chay fruit sauce; 3) Grilled fresh water eel fish with pagoda flowers and green peppers, served with pagoda flower cake; 4) Stewed chicken and velvet with nutmeg and papaya seeds, served with lotus seeds; 5) Cassava cake stuffed Thi fruits, served with Gordon pineapple jam. Chef Pham Van Dai spent lots of his time researching to look for something that can distinguish his team to others. Finally, he came up with the idea of using normal healthy ingredients; those were too normal to be noticed. After winning the 1st prize of Southeast preliminary, he flights to his hometown in Do Son (Hai Phong province) to look for rural ingredients that had left deep impression on his childhood. Chef Pham Van Dai excitedly introduced Thun Mun leaves. He had found Thun Mun (Embelia ribes Burn), a wild tree that people had eaten its leaves to avoid dehydration. 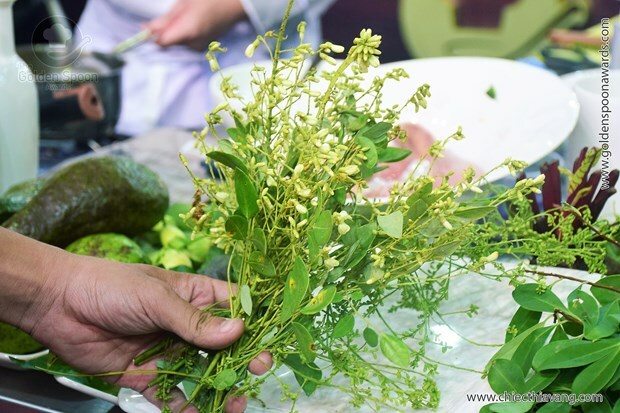 Chef Dai said that Thun Mun leaves brought a fresh sourness to dishes, just a sour hint to enrich the whole flavor. On the journey, the chef had come to hundred-years-old Thi tree on Ngoc mountain for the fruits. After storms, the old tree barely stood on the hill and the chef luckily collected its last fruits. He had visited his friend in the North and had seen pagoda tree with magical leaves, which were tea-like and so good with fish. He picked all those spices and combined them with hibiscus leaves, dried Chay fruits (Artocarpus tonkinensis), and papaya seeds. The golden dish: Stewed chicken and velvet with nutmeg and papaya seeds, served with lotus seeds. 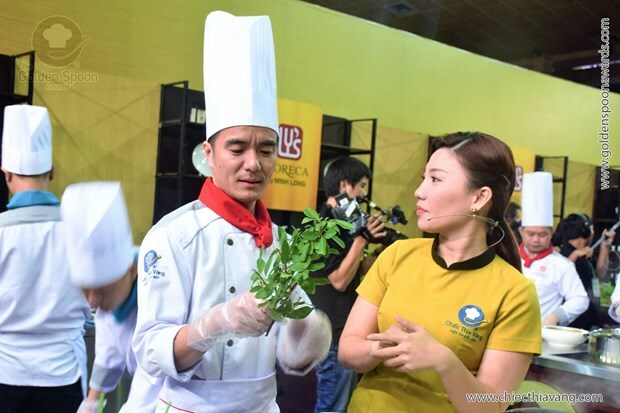 On the date of semi-final round, the whole team arrived HCMC early to get packages from the North - all hometown ingredients of chef Pham Van Dai. Their careful preparation and teamwork had paid off. 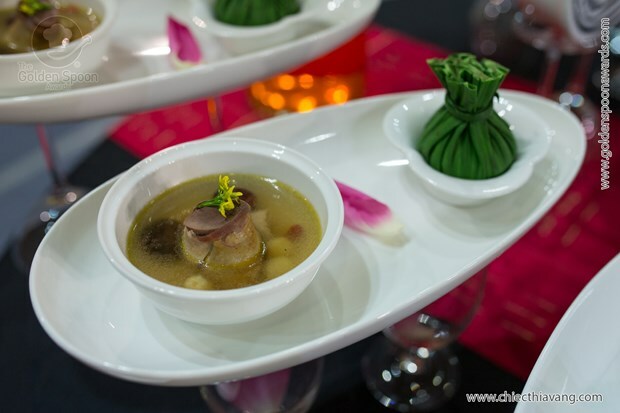 The appetizer included 2 dishes and both used wild leaves, Thun Mun and hibiscus, which were appreciated by judges. The sourness stimulated appetite through the meal. The chefs shared his tips that fresh saltwater crabmeat was vital, and hibiscus sauce needed very-enough lime juice or the salad would be too sour. The salad dressing included mayonnaise, hibiscus, white sugar, fish sauce, olive oil, and lime juice. 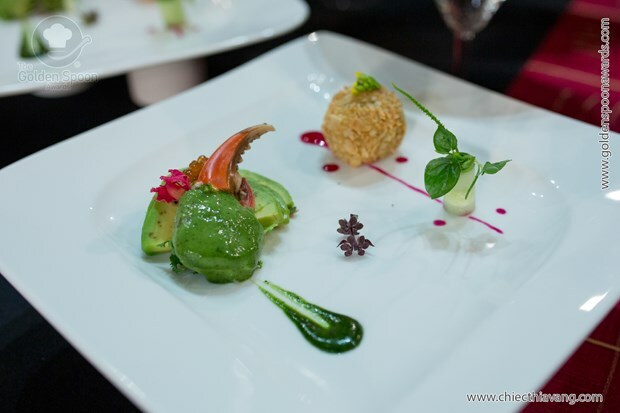 Appetizer has 2 dishes: Salad Thun Mun leaves with avocado, crabmeat, and salmon caviar in hibiscus sauce - Shrimp and periwinkle kneaded with pepper leaves, served with Chay fruit sauce and vegetables. The second dish of appetizer course was the combination of 2 healthy seafood, shrimps and periwinkle, with chili leaves. The lead chef said that chili leaves had a high oxidative level, which was good for diabetes patients, and to help slowing down aging process. 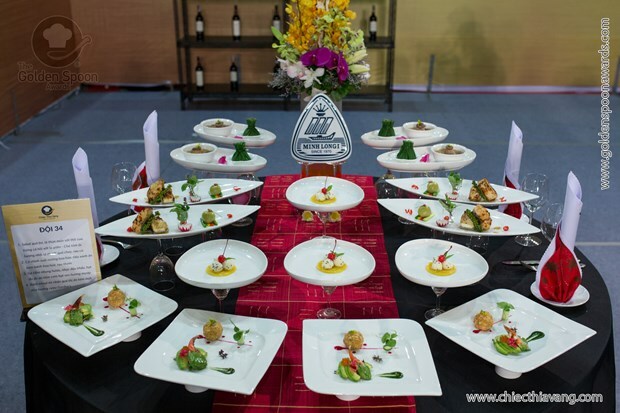 From the idea of traditional sweet-rice cakes (banh chung, banh day), the dish was displayed as a sphere to send a message that Vietnamese food would be brought around the world. The key of this dish laid on the way chefs cleaned fresh shrimps by fresh coconut juice. The seafood paste was chewy yet crunchy with featured aroma of chili and almond. Chay fruit sauce was also a special aspect with its thick texture and mildly sour taste well blended in a bed of spices, including pineapples, beets, chili, lemongrass, cinnamon, cloves, and cardamom. 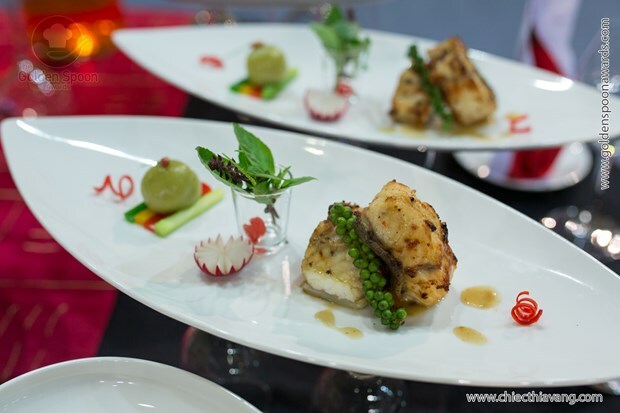 Grilled fresh water eel fish with pagoda flowers and green peppers, served with pagoda flower cakes and herbs. Pagoda flowers were such discovery in the dish. Those flowers have cooling effects on human bodies so they need to stay with hot spices as peppers or chili to balance out. Chefs chose big eel fish from flowing streams and cleaned it in ginger rice wine to reduce its smell. First time of pagoda flowers in The Golden Spoon contest. Pagoda flower cakes were not too complex to finish. Leaves and flowers were grinded and filter to extract some juice. The juice was mixed in sweet rice flour with a teaspoon of salt. Final dough was evenly divided and stuffed by cooked lotus seeds. After 10 minutes boiling, the cakes were ready to serve. Cassava cake stuffed Thi fruit – Gordon pineapple jam. Among the treasure of Vietnamese fairy tales, Tam Cam is one of the most well known stories with a detail of a Thi fruit. Being inspired by that mysterious tale, the team was confident to bring Thi fruits into golden dishes. 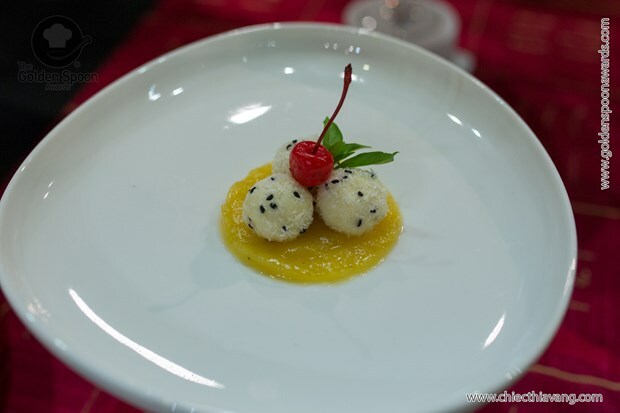 The combination of Thi fruits’ fragrance, buttery cassava, and special sweetness of pineapple jam absolutely persuaded the whole jury to give them the best comments.